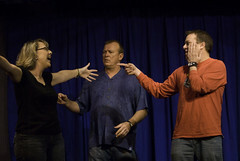 This is a four-player format, in which each of the improvisers take turns directing the other three in a scene or game of his/her choosing. The director can be very hands-on, replaying, stopping, or jumping into scenes. The audience judges each scene, awarding either a banana (win) or a forfeit (lose); a forfeit is some kind of humiliation the player must do or perform.